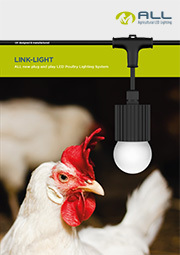 Technological advances in lighting, make LED’s ideal for poultry farming. Combining simple installation and operation, along with low energy consumption and a virtually maintenance free system. 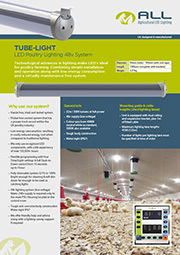 Designed from scratch around the poultry industry requirements, here in the UK. Our team has a long history in LED lighting technology providing us with the skill set required, ensuring the reliability and quality of our products. Designed with a digital high frequency signal, producing a flicker free light with a truly fluid dimmable system. A quality branded LED is also used to ensure a consistent colour and wavelength pattern. Utilising some of the most modern lighting technology, whilst ensuring the lighting unit and control system is as contemporary as possible. The control panel is easy to use with large robust buttons and large clear LCD displays. Why choose our lighting system? 48v lighting system (low voltage), each lighting lane has its own power-supply (PSU) mounted in the control room to ease any future maintenance. Tough body construction with satin finish to enhance glare diffusion. © 2018 Agricultural LED Lighting Ltd.